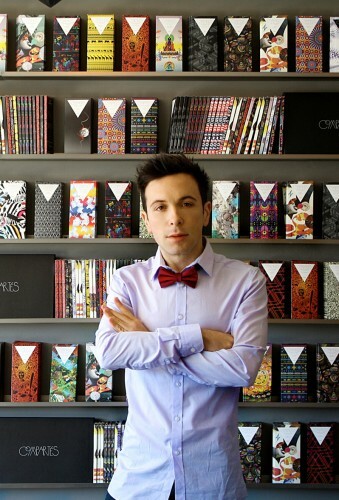 Compartes Chocolatier frontman Jonathan Grahm answers all of our burning questions about the new-school chocolate boom. If you go looking for a chocolate bar in Whole Foods these days, you’ll find that things are a lot different from the days when supermarket shelves were stacked with nothing but Hershey’s and Snickers, and maybe some Godiva if the place had some ambition. The designer chocolate boom is in full swing, and now it’s all beautifully wrapped, hand-crafted bars emblazoned with cacao percentages and information about the farm where the beans came from. One thing’s for sure: a Mast Brothers black-truffle chocolate bar made in Brooklyn makes a better gift than a bag of bite-size Milky Ways. But in terms of your regular chocolate-eating needs, there are plenty of questions to be asked of the modern chocolatier: What do cacao percentages even mean? Why are single-origin chocolates supposed to be tastier? And while we’re at it, what’s the deal with chocolate being healthy? We decided it was time to holler at a chocolate pro to get some answers. Based out of L.A., Compartes Chocolatier is helmed by new-wave chocolate mastermind Jonathan Grahm. When he was 19, Grahm began making chocolates for fun without ever attending a culinary class or going through any formal chocolatier training. Turns out he wasn’t half bad at it. Since then, his chocolates have been named “Top of the Nation” by Food & Wine Magazine, he has worked as a chocolate expert for Oprah, and he’s built a mini empire of seven stores abroad in Tokyo. Here, Grahm schools us to the things you need to know to be an informed chocolate consumer, tackling everything from health benefits to the real differences between dark, milk, and white varieties. Chocolate class is in session. If you go looking for a chocolate bar in Whole Foods these days, you&apos;ll find that things are a lot different from the days when supermarket shelves were stacked with nothing but Hershey&apos;s and Snickers, and maybe some Godiva if the place had some ambition. The designer chocolate boom is in full swing, and now it&apos;s all beautifully wrapped, hand-crafted bars emblazoned with cacao percentages and information about the farm where the beans came from. One thing&apos;s for sure: a Mast Brothers black-truffle chocolate bar made in Brooklyn makes a better gift than a bag of bite-size Milky Ways. But in terms of your regular chocolate-eating needs, there are plenty of questions to be asked of the modern chocolatier: What do cacao percentages even mean? Why are single-origin chocolates supposed to be tastier? And while we&apos;re at it, what&apos;s the deal with chocolate being healthy? We decided it was time to holler at a chocolate pro to get some answers. The Expert: Based out of L.A., Compartes Chocolatier is helmed by new-wave chocolate mastermind Jonathan Grahm. When he was 19, Grahm began making chocolates for fun without ever attending a culinary class or going through any formal chocolatier training. Turns out he wasn&apos;t half bad at it. Since then, his chocolates have been named "Top of the Nation" by Food & Wine Magazine, he has worked as a chocolate expert for Oprah, and he&apos;s built a mini empire of seven stores abroad in Tokyo. Grahm says: Absolutely. Dark chocolate has some of the highest concentrations of antioxidants of any food. Chocolate is healthier than both red wine and green tea. That is, of course, talking about dark chocolate, more so than white chocolate or milk chocolate. Because it has a higher concentration of cacao, dark chocolate has a lot more health benefits than the other two. If you are going to buy Nestlé Crunch bars and think that is healthy for you, then no, it is not the case. It is the higher quality, darker chocolate that is healthy and better. What Does Single Origin Mean and What are the Benefits? Grahm says: What single origin means is that it is just from one country or region—nothing more specific. Just like wine that's made from a blend of grapes, most chocolate is made from a blend of cacao from different regions. Single-origin chocolate is one type of cacao from one region. That does not mean one farmer. It is a common misconception that single origin means one grower. A lot of people will buy a wine just because it is from a single vineyard, but single-origin cacao does not mean it is one farm. The cacao that I get is from one particular grower, and so it is easier to distinguish flavor notes because it is not a blend. Chocolate will have particular characteristics determined by the terroir of a place. Because chocolate comes from a fruit (it is the seeds inside of the fruit), there are vast differences in taste between locations, even from different farms in the same region. What Do Cacao Percentages Really Tell You? Grahm says: A lot of cacao percentages are just about marketing. People will probably be mad at me for saying that, but you have to look at what other ingredients the chocolate is made up of. I have had chocolates that are around 73% cacao that taste a lot more pure and chocolatey than ones that I have eaten that are 77%. I don’t think consumers should be guided by the cacao percentage alone; they should really be reading the ingredients labels and seeing what else is in a chocolate. If there are any other additives, added flavors, or milk products, those are things to look out for. All of our dark chocolate here is vegan with no added milk. I think there is a perception that the higher the percentage of cacao, the better the chocolate is. I don’t think that is necessarily accurate. It really depends on where it is from and how it is being processed. What Percentage Tends to Be Most Popular? Grahm says: Generally, my favorite tasting chocolate is anywhere from about 72% to 77% cacao. At my store, I usually coat everything in a custom 73% single origin chocolate. I feel like at 85-90%, it becomes just too much. At that point it becomes so bitter that it is something I refer to as the “vitamization” of chocolate. When you eat chocolate it should have health benefits, but at the same time it is still an indulgence. I would rather have a 72-75% piece of chocolate that still has a hint of sweetness with the same health benefits than something that doesn’t taste as pleasurable. There is a reason why chocolate has been perceived as a euphoric thing, because it is. If I am looking to eat something healthy I am obviously not turning to chocolate, it just happens to be a desert that has health benefits. Cacao percentages still don’t make it only about health—at the end of the day, it is about taste. What Should You Look for When Buying Artisanal Chocolate? Grahm says: I think that comes down to looking at paying for the higher percentage of cacoa and the additives and ingredients that are in the bar. If you flip over a Crunch bar or any generic bar in the market, you are certainly going to see that there is a huge difference in ingredients. With chocolate, fewer ingredients usually means better quality. When you are paying for a high-quality chocolate bar, you should look for single origin and handmade chocolate. That cost is transferred to the consumer for the ingredients, but you are paying more for a chocolate that is better quality. Is European Still Better than American? Grahm says: I think we are definitely seeing a shift toward American chocolate. Originally, American chocolate was perceived as sugary milk chocolate—a junk food like McDonald's. M&Ms and Crunch bars were the only association with American chocolate for a long time, whereas Godiva—which is a European brand—was the one known as the upscale chocolate. Now, you are seeing those perceptions change with these high-quality, artisan chocolatiers in America. There is also an old-school, uppity classical mentality associated with European chocolate that you are seeing new American food artisans bucking. There is still that white-glove mentality over there and I think that is not a part of the chocolate movement here. It’s just a different feeling. Which Regions are the Best for Cacao? Grahm says: There are so many variables with where cacao comes from and the process of making the product. But you can definitely develop a preference for a certain region as a consumer. I really love South American cacao because it is growing in a really lush rainforest region. With cacao from there, you are getting a really tropical note and added sweetness, so you don’t need as much extra sugar. Is Milk Chocolate Considered Not as Good as Dark? Grahm says: My milk chocolate is still in the 50-percentile of cacao, which is more than most that you will find in the market. I actually have no idea what you would find in a grocery store chocolate. I don’t think milk chocolate or white chocolate is bad at all. There is a time and place for everything. With milk chocolate, you are getting a classic nostalgic flavor. High-end milk chocolate will taste superior and have a stronger depth of flavor than the lower-end representations. Grahm says: White chocolate is not a chocolate at all, and a lot of people confuse that. Most times there is not cacao content and there is no caffeine. If someone has an allergy to either of those things, white chocolate makes a great alternative. White chocolate is mostly cocoa butter and sugar. Page Is Chocolate Really Healthy?